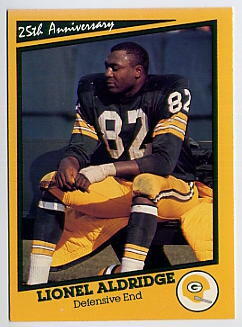 A Lionel Aldridge trading card. When his playing days were over, Aldridge became a sports broadcaster here in Milwaukee – and nationally. But a battle with mental illness led him to disappear for years, until he recovered sufficiently to come back to prominence here in the 1990s. But there is a lot to the story of the late Lionel Aldridge that is not well-known. And to understand it, you also need to learn another story – that of his former wife, Vicky. Milwaukee Magazine senior editor Howie Magner writes about both of them in a remarkable article in the January issue, and he joined Lake Effect's Mitch Teich in the studio to give a preview. "I don't think they set out to be pioneers when they ended up being basically the first interracial marriage in the NFL. But they were two people who fell in love and if they were going to be together, and Lionel was going to play the sport that he loved at the highest level, then they basically had to be pioneers," Magner said.